Cherie's art this week reflects Bible verses talking about courage. Cyndi is taking her resolution to use up previously made samples veeeeeery seriously! Marcia DeCoster's new book, Marcia DeCoster Presents, is a great inspiration! 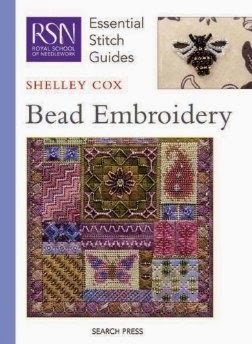 See Jean's review of this unique collection of interviews of 30 of the most remarkable beading stars in the world on jean's blog, and comment if you are a US resident for the GIVEAWAY, ENDING FEB. 6th! Are you looking for some Valentine's Day inspiration? The Artful Crafter has everything from card designs, to decorated candles, recipes and more. Do you know what a bagalope is or how to make a multicolored heart shaped crayon? I have never made a baby mobile. It was so much fun to create one with Peter Rabbit imagery from Crafter's Companion. You'll never wonder what to put in resin again after viewing the 60+ artist submissions currently on the Resin Crafts Blog. Twenty more will be added next week! Even the furry children need something soft to snuggle with. Here's an easy little afghan for them or a lap-ghan for you. A few more folk art dolls before moving on to mail art! Busy, busy, busy! Andrew shares some of the things he's been up to lately! Check out more Pinterest Inspiration Board advice from Kylie Parry! Lucky lucky girl!! 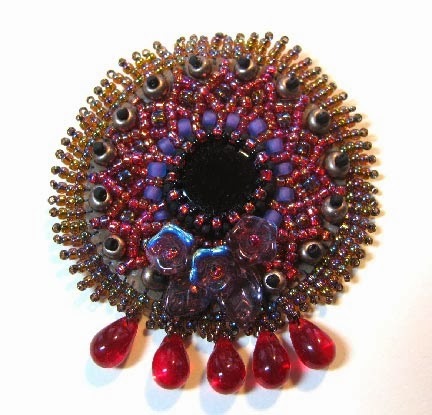 Wendy Kovin has won a class from Mastered on Tambour Beading! I should remind all of you that if you visit their site, you can get a free trial period for any class that you're thinking about taking, so that you can see for yourself the great value offered. Good think to think about to fulfill your New Year's resolution to learn something new! 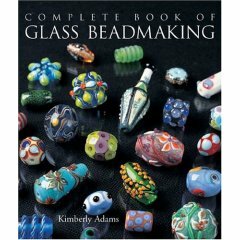 Most of these reviews that I've written are of books that show how to make lampwork beads, but I've included a few that cover what to do with those beads once you've accumulated a whole pile of them. Let me just warn you right now that making glass beads is addictive. No fair blaming me later...you've been warned! My current favorite book to recommend to beginners and intermediates. For intermediates and advanced artists. What to do with 'em once you've got 'em. 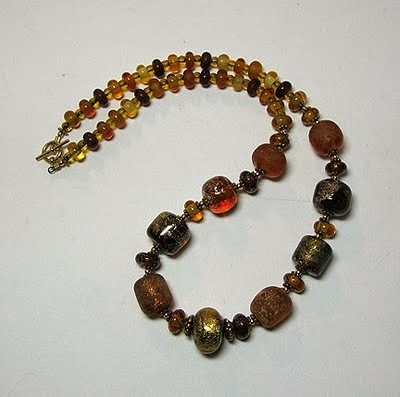 More simple projects to showcase beautiful beads. 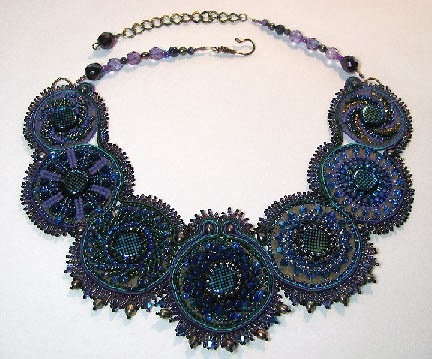 A lot of wonderful designs that will work with large-holed beads. Working with hot glass or warm glass gets me excited! I hope that you enjoy lampworked and fused beads too, either making them or collecting and using them in your work. Here are my tutorials from over the years that will help you get started! Cherie starts a quilt with embroidery, applique, and mixed media items. Some crafters and artists keep notebook journals of their ideas and projects. Eileen has fine-tuned a digital system which works really well for her. With digital cameras, it's easy to take step-by-step photos as you go. Jean makes a Winter Tree of Life Pendant, inspired by a friend on Facebook who is creating Trees of Life as he swelters in the heat of summer in Australia! Cyndi has started a new collage quilt, featuring one of her favorite birds...the chickadee! Charlene mixes elements from different worlds and cultures. Can it work and can you do it too? A wonderful series has begun on Resin Crafts blog. I am sharing over 80 different artists submissions featuring a pocket watch. You will be so inspired! 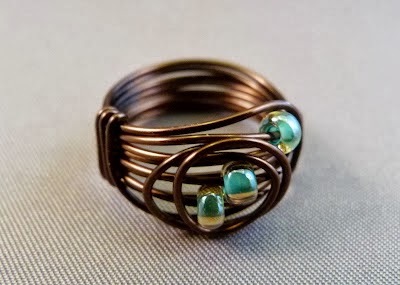 The mess is corralled for now, and that means time and space to design some jewelry! Looking for Valentine's Day project inspiration...Lisa's sharing heartfelt projects created by her fellow Cousin Corp ambassadors. What's up next for the Inspired by Reading Book Club? Andrew shares the reading list for the next round of books! 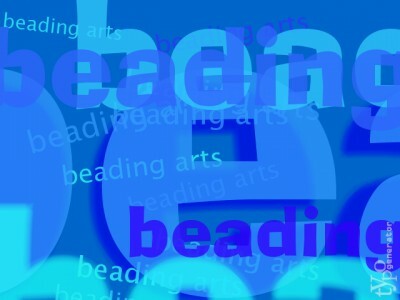 New online tambour beading class available...and a giveaway! We've only spoken about tambour beading a few times here on Beading Arts, mostly because I know nothing about the technique other than how it looks. Recently, I was contacted by Mastered, a British company offering online fashion and jewelry master classes, and guess what they have added to their line-up? 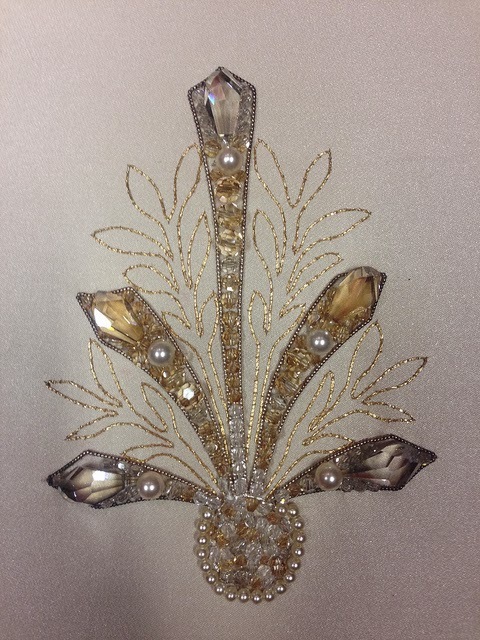 A class called "Couture embellishment: Tambour beading"! Mastered offers a free trial of every course, so I visited the this one and found that the whole set up is very user friendly and thorough. 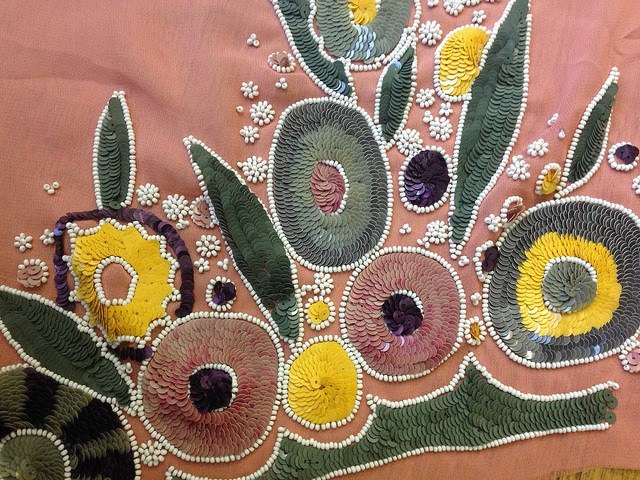 This course is being taught by artists at Hand & Lock, a 246-year-old embroidery company which has worked with the finest couture houses in the world, as well as created work for the Queen and Royal family, and the British military. Within each module you'll find a mix of HD video content, written tutorials and exercises. They take you from learning the chain stitch, to working with the beads and sequins to advanced tambour techniques and working with beads of different types. 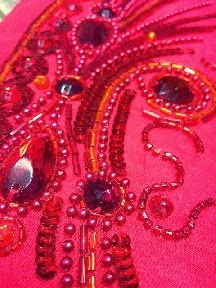 You'll then learn how to design your own pieces of beading and how to apply the designs to different mediums. You can ask questions at any stage. These are answered by the course tutors and other members of the community. You are welcome to upload pictures of your work in progress so that you can get feedback. You also get exclusive access to the 'Mastered Meets' online seminars which are discussions/Q&A with industry insiders. Finally you get support to take your work further, whether that's introductions to the press or buyers or business advice. Pretty cool, huh? 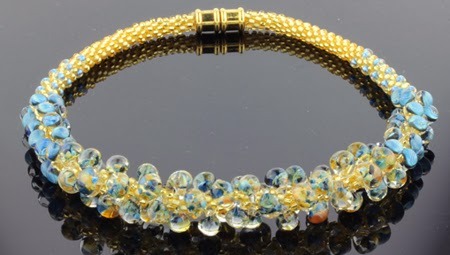 How would you like to win a free course in tambour beading from Mastered? Please read this carefully! What we want to know from you is which of the other courses Mastered offers would you like to try as a free trial? Leave me your answer here and include your email address. If I don't see your email address, I won't be able to contact you. No contact, no win, and I simply have to go on to the next person. You are welcome to spell it out if you'd prefer, for example, cyndi at mazeltovjewelry dot com. If you tweet or post on Facebook or other social spots about the contest, you can leave a second comment and be entered twice! Deadline: January 29, 2014. In the meantime while you wait, you are invited to go try out that free trial for any class that interests you! It's official...I'm crazy about these little pendants and I can't seem to stop making them! It's great though, because they've allowed me to play with combining various stitches and I've been thinking a lot about making my next large piece, probably by assembling components rather than using one large necklace template. So just as soon as I settle on a color palette and/or some focal points, I'll be getting started on that. 1. 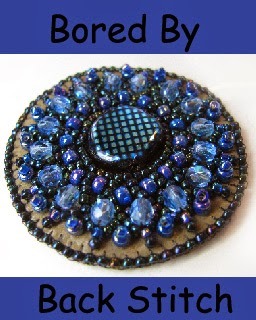 Add two rows of back stitched size 11/0 seed beads around the button. This button has a shank, and so I've sunk it below the surface of the foundation fabric in order not to have to damage it. 2. Using the bead embroidered form of African helix, I added a first row to the inner ring of back stitched beads. Using the outer row of back stitching as a base, I added the full African helix motif, and stitched 4mm and 6mm rounds into the "holes". 3. Cut out the pendant and the backing fabric to match and add edging brick stitch around the outside. Stitch small stacks or picots of seed beads around the edge for embellishment. 4. Stitch a square stitch bail to the back. The button came from a market in Portland Oregon. Cherie makes a new afghan to keep the family warm. Do you amigurumi? Why or why not? Mobius strip scarves, part two! Cyndi shows you how to work with thicker chunky yarn this week. Jean reviews an excellent book on jewelry design from the great Cathy Jakicic: Jewelry Projects from a Beading Insider--it is wonderful! This jewelry organizer is not only very decorative hanging on the wall, but also allows you to keep your most-worn pieces organized right at eye level. Put them on and check yourself out in the mirrored front. What could be more convenient? 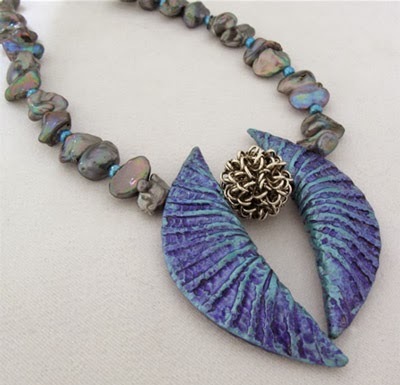 Andrew reveals where his porcelain pendants will be at during this year's Tucson Gem Show! Wire has never been my primary material, although I love the look of it...especially when someone who really knows what they're doing uses it! 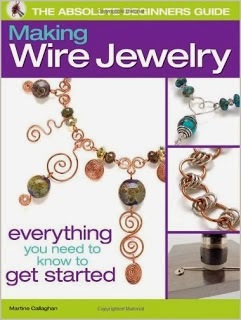 However, even a fumble-fingers like me can put together some fun projects that incorporate wire in different ways! Do you find the idea of soldering metal intimidating? 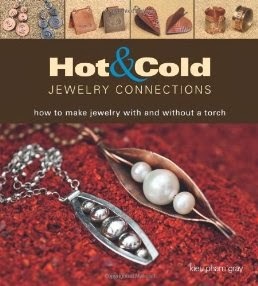 Then perhaps this book will help you change your mind: Hot and Cold Jewelry Connections by Kieu Pham Gray gives you choices with each project. You can chose to do the "safe" cold connection, or you can branch out and try the "dangerous" one! Either way, you'll end up with a beautiful project. This is a good beginner's book on working with metal. About a third of the book is devoted to the basics of metal tools, materials, and working techniques, including wire, sheet metal, riveting, patinas, annealing, soldering, and polishing. Next, you'll be challenged to work your way through ten pairs of projects designed to show you both hot and cold options for construction. As you advance through them, you'll have the opportunity to compare, for example, soldered hinges with rivets and jump rings, soldered jump rings with wire binding, and soldered prongs with filigree tabs. 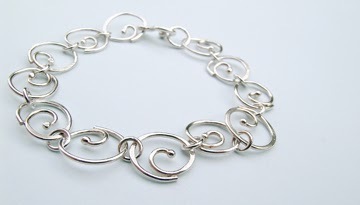 Whether it is made with the hot or the cold techniques, my very favorite piece is also a very simple one: a lovely spiral chain shown on page 74 (and shown above). I want to make this in both methods! For your inspiration and encouragement, here are artist profiles from some of the best polymer clay artists out there! Quite a few years ago, I took my first journey into kumihimo territory, and bought a few books by Jacqui Carey, whom I still consider to be an amazing kumihimo artist and author. 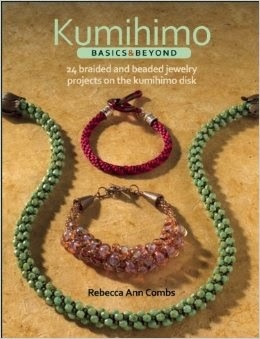 So I was excited to see the newest book on this topic, Kumihimo Basics & Beyond by Rebecca Ann Combs. For organization and clarity of instructions, I have to recommend this new book, even though it never moves beyond the most basic style of round braid. There is something to be said for exploring all the possibilities in one form before moving on to others, many of which you will find in Jacqui's books. Kumihimo is simply the term for traditional Japanese braiding, either the act of braiding or the braid itself. 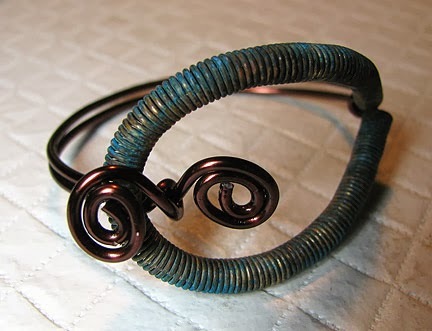 These braids are great for hanging your special focal beads or pendants, but they can also be beaded in their own right. Rebecca has arranged her book so that if you work through it in order, you'll pick up all the tips and tricks that you'll need to go off and move beyond what is contained here. She starts with information on the tools (very few), the fiber types, how to chose an end cap, and includes some handy cheat sheet charts. The first section of projects teaches the basic round braid in fibers only. Rebecca covers how to start, the basic pattern, binding, and finishing with end caps. She shows lots of color patterns that you can try in the future, teaches the no-knot start variation, and explains how to combine fibers in the slots. The next section covers adding beads to your braids. 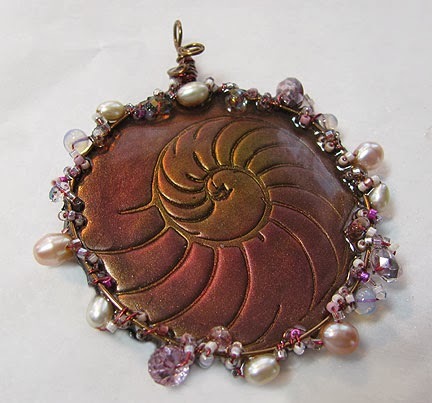 You 'll learn the additional tools needed, how to make a basic beaded rope, how to use different sized beads together, how to braid around a core, how to use shaped beads like teardrops and magatamas, and how to add focal beads and pendants. Throughout, the instructions and photos are crystal clear. It's been years since I played with kumihimo, but I found myself nodding along as I read through Rebecca's directions. Even though the book only covers the one style of braid, I think you'll find more than enough variation here to keep you busy for a long long time! 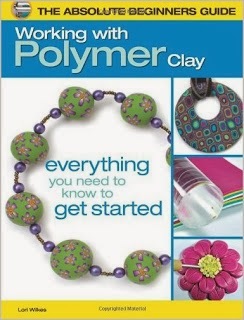 You know there have been some years that I actually skipped Polymer Clay month, right? Please don't hate me...you know that it's just not my strong suit. But other years, thanks to the encouragement of talented friends who are also polymer clay artists, I got inspired to pick up my polymer tools (very very basic) and make some new projects for you. Here is a collection of those projects from over the years!